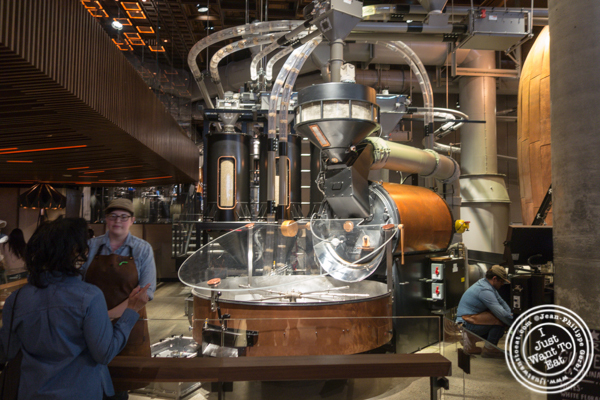 Starbucks is elevating its coffee shops with Starbucks Reserve, an elegant and sophisticated version that opened in NYC last December, right next to Chelsea Market. Already popular amongst New Yorkers, this 23,000 sqft place is amazing: two stories if not counting the downstairs floor where the bathrooms are, where a bar, sandwich and pastry stations feed an hungry crowd with some delicious food still casual but tasty, and Italian inspired. Sandwiches are made with breads from Le Pain Quotidien with a mix of vegetarian and non-vegetarian choices like the caprese panino made with mozzarella di bufala, cherry tomatoes and arugula; the sfilatino con pistachio mortadella that is made on a crispy thin olive bread or the brioche con prosciutto crudo e parmigiano regiano that is a croissant shaped brioche stuffed with prosciutto and Parmesan cheese. All of these were fresh and succulent, not that pricey for the quality you get. As far as beverages are concerned, you get the usual Starbucks offer like the matcha tea or latte, as well as their nitro cold brew that is served elsewhere and was good and refreshing although a bit light for me. But they also propose additional choices: for an espresso, you can choose between beans from Guatemala or their gravitas blend. All of that in real cups, like in a café. I should mention the hospitality of the staff that goes beyond regular service: they want to make sure you have a good experience. Starbucks Reserve definitely reinvents the Seattle chain, a much needed move considering the competition out there and with plans to settle in Chicago or Tokyo, after Milan and Shanghai, I just hope they will not open too many locations, keeping it rare and exceptional. I should mention that this place is packed on the week end and weekdays are much better if you mind the crowd. Despite that, I would go back as they have so many mouth watering choices like their pizzas or desserts. I just love it!